At best, the project’s opponents overplayed their hands in the negotiating process. At worst, they showed a serious disregard for the creation of thousands of well-paying jobs for New York’s residents. Perhaps they failed to recognize that Amazon and other businesses that could potentially locate within the state would be unwilling to risk timely project completion to time-consuming debates about incentive packages or about their fitness as corporate neighbors. 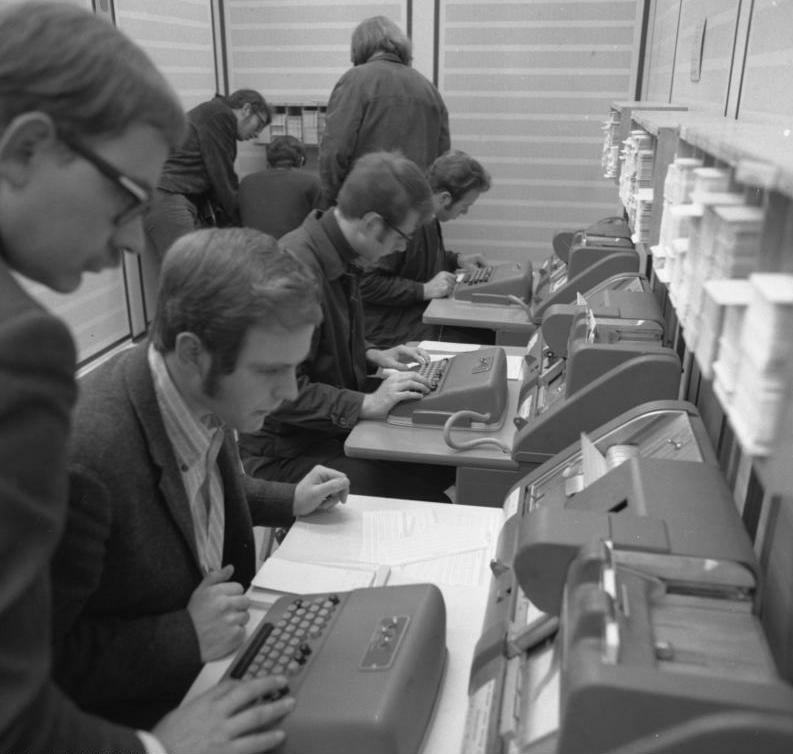 New York City had significant advantages as a business location for Amazon, perhaps the largest of which was the metropolitan area workforce, the largest in the nation, with its high concentration of information technology workers. 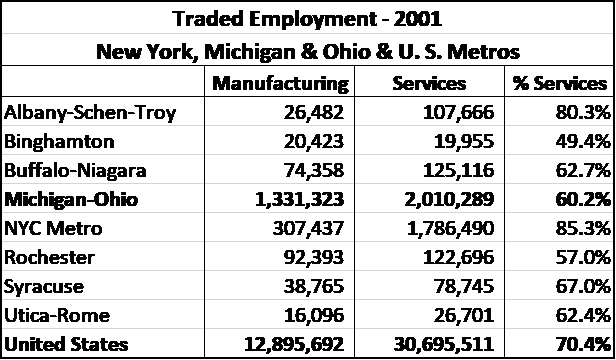 But, New York’s labor market advantages weren’t large enough to rule out other competitors. Metropolitan areas like Washington, DC, Boston, Atlanta and Dallas had large enough labor pools to meet Amazon’s needs. 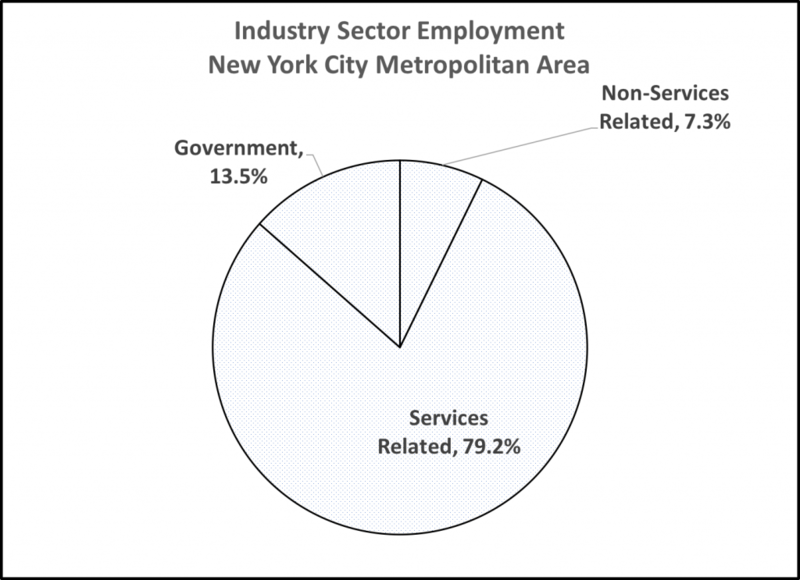 In the wake of Amazon’s decision, other New York metros have offered themselves as alternatives but simply lack enough potential employees for a large information technology business headquarters. Amazon’s proposed HQ2 project is unique – initially offering 50,000 jobs – more than any business expansion project in memory. Economic logic tells us that Amazon had tremendous market power in making its decision. Because of America’s Federal system, states can freely compete with each other to attract businesses. Given that, it should not be surprising that there was intense competition between locations seeking to be home to the project. States and localities market themselves by advertising the availability of tax incentives to businesses. New York has been among the most aggressive in promoting them emphasizing the value of incentives available to companies that promise to create jobs. State marketing marketing materials claim that “You’ll find all forms of tax incentives, business incentives and tax credits in New York State, all designed to benefit small or expanding businesses as well as film and TV production companies.” and that the state “offers new and expanding businesses the opportunity to operate tax-free for 10 years.” In another place on the Empire State Development website, the text states, “Firms in the Excelsior Jobs Program may qualify for four fully refundable tax credits” New York City has a set of tax credits aimed at encouraging business investment in specific locations. 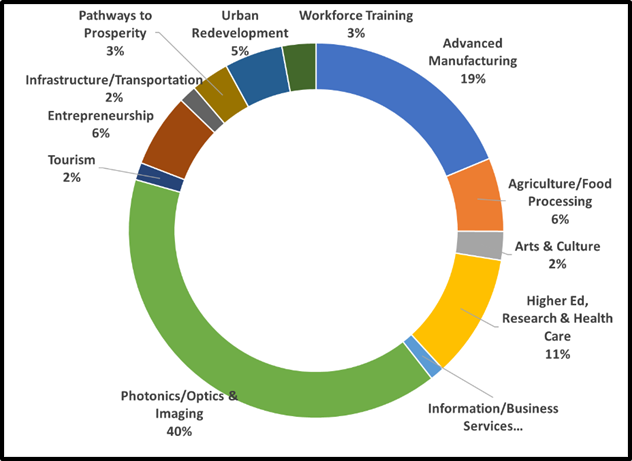 New York used incentives to attract businesses, spending billions of dollars to encourage technology development at Global Foundries in Saratoga County and at the Tesla Gigafactory 2 in Buffalo, among others. These technology related projects carried high risks. Tesla’s Buffalo venture, for example, is far short of the number of jobs that it promised to create and a film hub, developed in Syracuse, never attracted enough users to make it viable. A semiconductor manufacturer (ams AG) dropped plans to build a facility in Oneida County despite a substantial incentive package. Amazon’s project was different, carrying relatively little risk for New York State. Amazon is the market leader in internet commerce. Though the deal was expensive – possibly more expensive than it needed to be, at least the tax credit incentives were performance based, and the capital grant would have contained recapture provisions if the company failed to meet job requirements. Does Corporate Greed Make States Use Incentives? Amazon received hundreds of proposals from localities hoping to secure the facility. New York’s winning $3 billion offer (about $1.7 billion from the state and $1.3 billion from the city) was not the largest. Offers from New Jersey ($7 billion) and Maryland ($8 billion) for the entire 50,000-job site were larger. Leonhardt’s piece argues that states and localities are helpless victims of corporate greed. In fact, governments are eager participants in corporate location competitions. When New York got AMD (later Global Foundries) to locate a large semiconductor manufacturing facility in Saratoga County more than one billion dollars in total incentives were offered the company. But, New York sought out semiconductor manufacturers, not the reverse. The state had initiated a campaign to lure a facility to the state years before the deal was made. The billion dollars in incentives was a lure, not the result of a bidding war. Virtually all states and many localities market themselves to businesses. Because location costs are often a factor in corporate decision-making, governments sell themselves as low cost locations, and use incentives, including tax incentives and cash grants, as marketing devices. Critics of these practices correctly point out that the use of business location incentives has several negative effects. They create disadvantages for existing local businesses that do not receive them. In cases where incentives go to companies that would have created jobs within the state without their benefit, they reduce revenues that would be available for needed government programs. Advertising the value of tax incentives to businesses increases the cost to state residents of attracting new jobs. New York advertises its Excelsior program as providing “A credit of 6.85% of wages per net new job [and]and an investment tax credit valued at 2% of qualified investments” creating expectations by companies that like Amazon that they would be eligible for credits, even though the credits are discretionary and subject to a budgetary cap. Given that the Excelsior Jobs Tax Credits that Amazon was offered were valued at $1.2 billion and that the company would have received $1.3 billion in tax credits from New York City, it is likely that they increased the size of New York’s offer beyond what it might have been if the credits had not been advertised by the state. The practice of providing financial incentives to businesses to locate within states and localities is destructive in a number of ways. It invites states and localities to give away needed revenues in order to attract jobs. It creates inequalities between companies that get benefits from government and those who don’t, creating the potential for crony capitalism. It distracts government of focusing on improving infrastructure and investing in human capital. 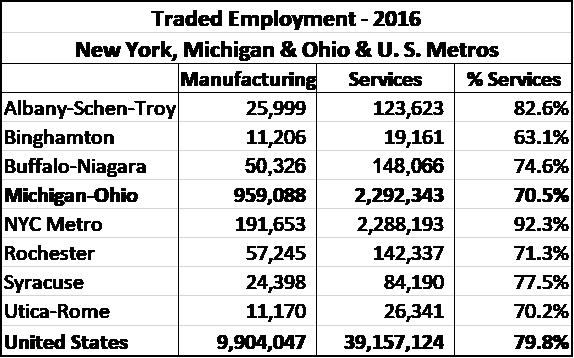 Unfortunately, because of America’s federal system, states have the ability to set tax policy and use it to compete with each other for jobs. 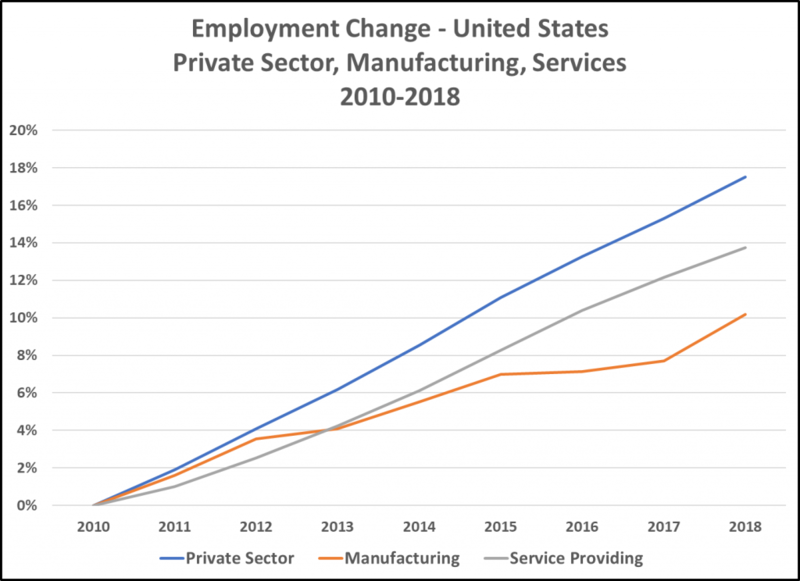 Voluntary efforts by states to refrain from incentive competitions have been ineffective in the past because of the high stakes involved in foregoing potential job creation. 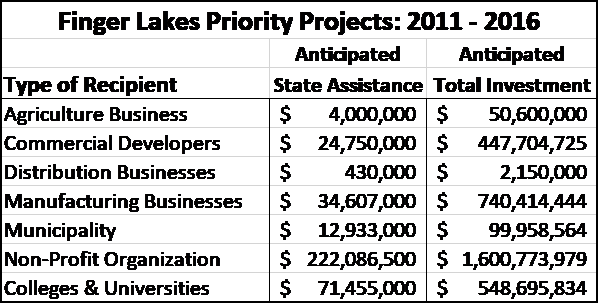 Because of its excessive reliance on tax incentives, New York likely pays more to companies for job creating projects than it could if it did not rely so heavily on them. The incentives create company expectations that they can receive generous tax long term tax breaks if they invest in New York. A policy that relied more on negotiated grants with strong claw-back provisions in the event of non-compliance with job creation requirements paid to reimburse corporate investments would provide a better return on the state’s investment. Although New York could have structured its Amazon incentive package more efficiently, the loss of 25,000 well-paying jobs (or more) to New York City is important both because of the foregone opportunity for area residents, and because it says to companies considering future projects in the city that New York’s political leadership is split between forces that welcome job creating projects and those who oppose them for a variety of reasons. Perhaps the Governor and Mayor could have paved the way to a better reception from local political leaders by offering more involvement at an earlier stage, but given New York’s fractious political environment, it’s not certain that additional consultation would have eliminated objections from powerful local officials. Low rates of labor market participation might indeed show that people are dropping out of the job market because of limited opportunities. 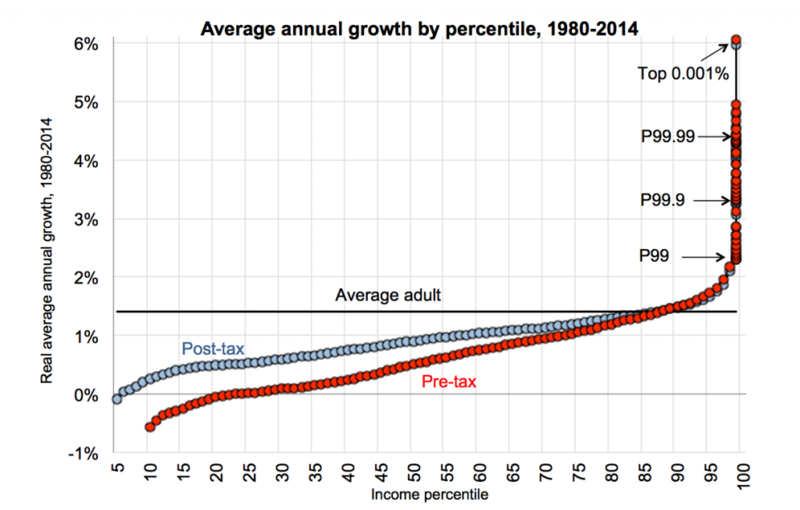 But, other factors are at work as well, including the aging of the population. 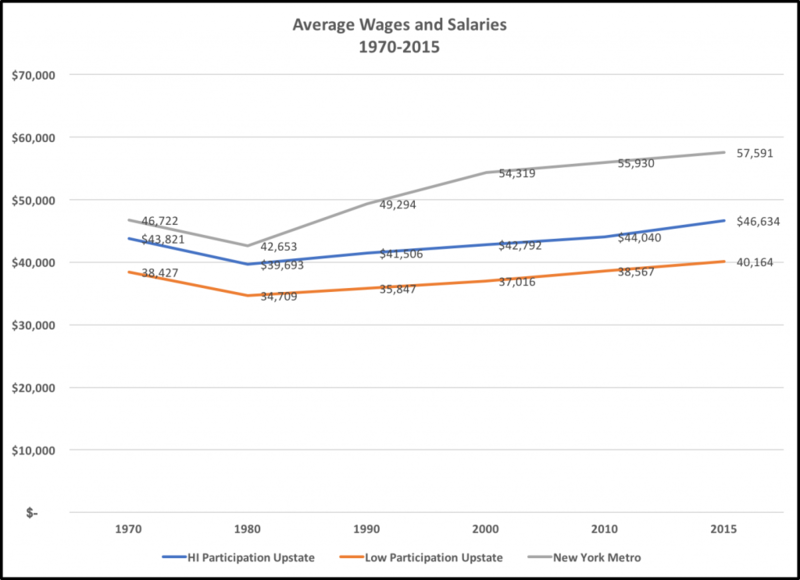 This post reviews labor market participation data in New York’s counties to understand changes over time and how low participation counties differ from those with higher participation rates. 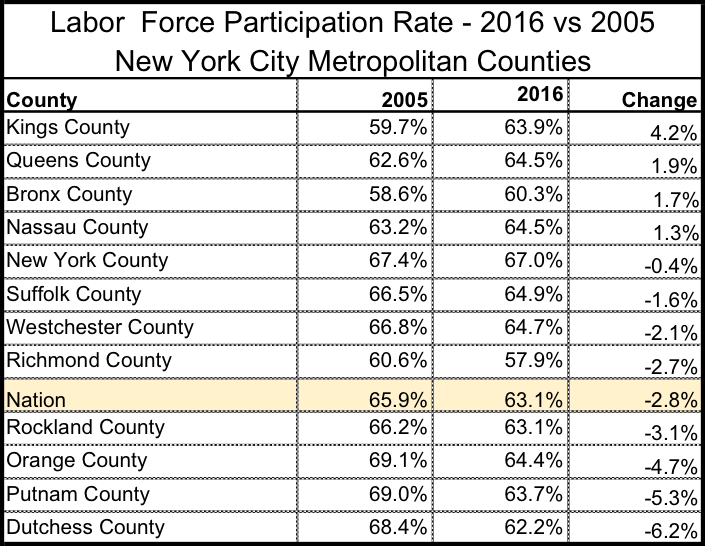 In this post, I look at differences in the labor force participation level between counties in New York State. 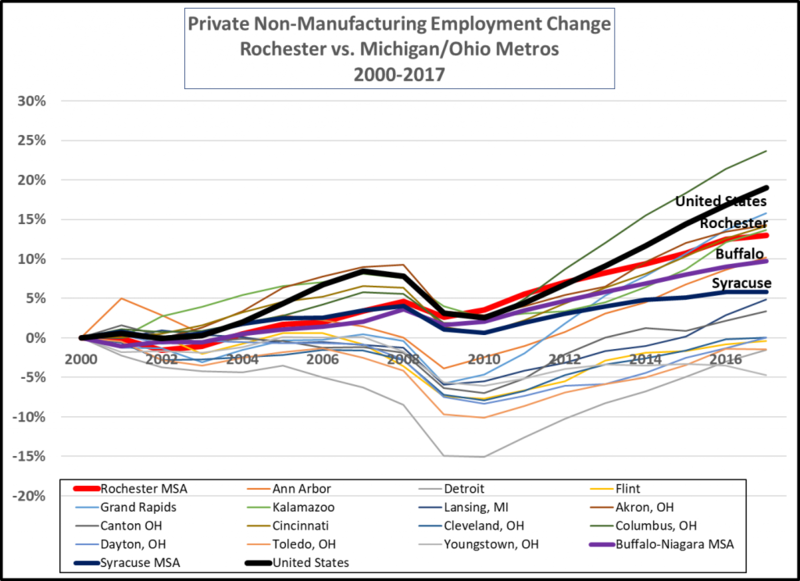 Because the economic performance of the New York City Metropolitan area has been stronger than upstate New York since 2000, participation in the two regions is examined separately, where relevant. This analysis is at the county level, and does not show differences in participation based on levels of economic disadvantage below the county level, particularly in urban centers where participation may also be low. 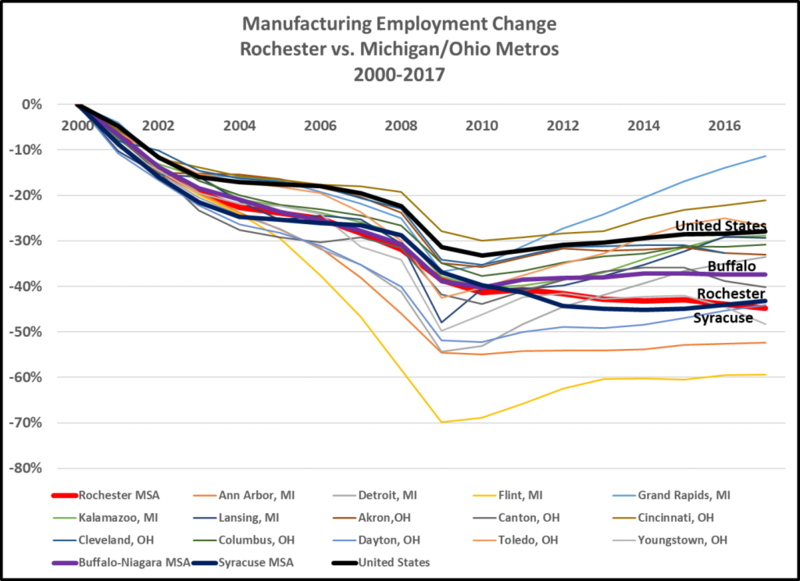 The data shows that while changes in labor market participation from 2005 to 2015 in the New York Metropolitan area, and in larger upstate metropolitan areas did not differ much from the nation as a whole, smaller metropolitan areas and rural upstate had greater declines than the nation. Comparing county performance in 2015, large differences were found in the educational attainment of residents of better and worse performing counties. The percentage of college graduates in the populations of the 15 counties in New York State was more than double that found in the 15 counties with the lowest level of participation. The behavior of residents within particular socio-economic groups in counties with high and low labor market participation varied as well. Disproportionately lower percentages of people who did not complete high school, residents who were black or Hispanic or male, and residents who were 25 and 34 years old and 55 and 64 participated in the labor market in counties where labor market participation was low. Data is from the Census Bureau’s American Community Survey. 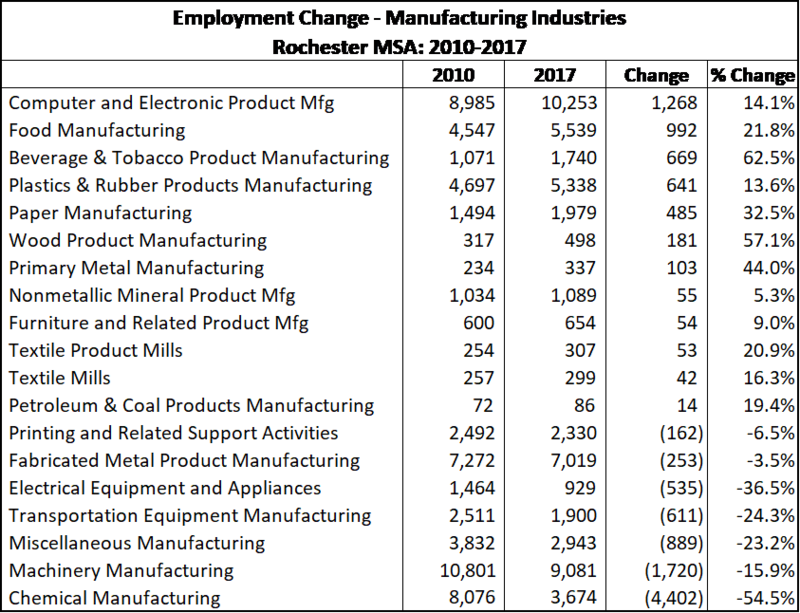 The Census Bureau data differs from the Bureau of Labor Statistics data referenced at the beginning of this post in its methodology and sample selection. The differences in methodology are discussed here. In this post, I use two different data samples. 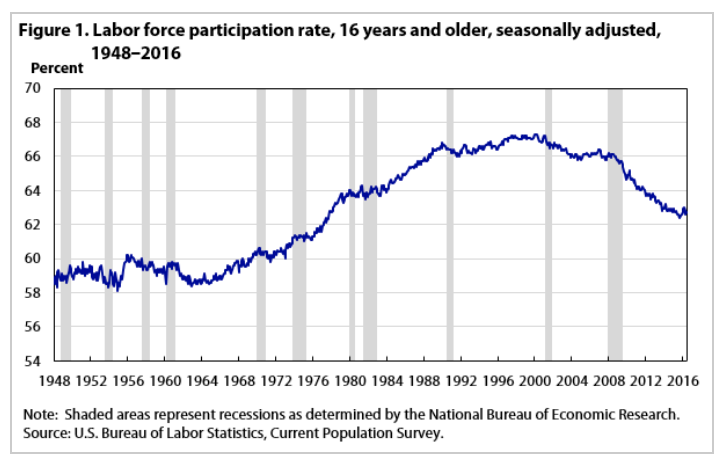 Beginning in 2005, county level labor force participation data is available from the Census Bureau’s American Community Survey. The sample used for the section titled “Change over Time” is from single year samples of one percent of the United States population. 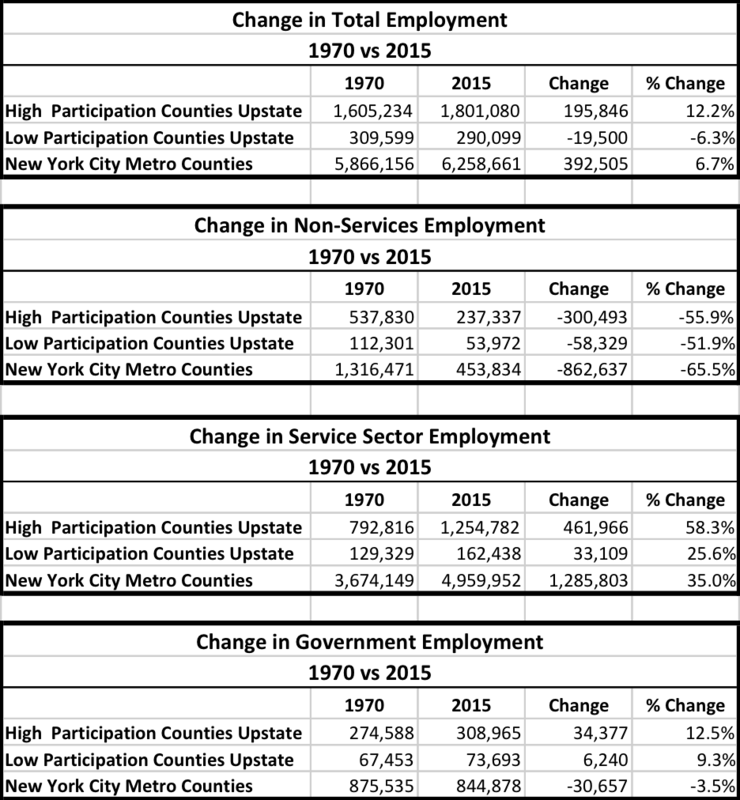 The single year samples are too small to permit an analysis of data for small population units. Consequently, only 37 of 62 counties in New York State are included. Because the sample is relatively small, estimates of smaller county characteristics can have relatively large errors – as much as 2.5% for labor force participation for the entire population, and as much as 5% for some groups within the overall population. In the section “Comparison of Labor Force Participation at the County Level in 2015” I use a five-year sample of the population that includes 5% of the United States population. Because the sample is larger, it includes all New York counties, and has less sampling error. Smaller county estimates are likely to be within 1.3% of the true value. Estimates of groups within the overall population should be within 3% of the true value. But, because the data is an average of five-year data, it lags trends, since the midpoint for the time period covered for the 2015 five-year data, which includes surveys from 2011 to 2015, is 2013. 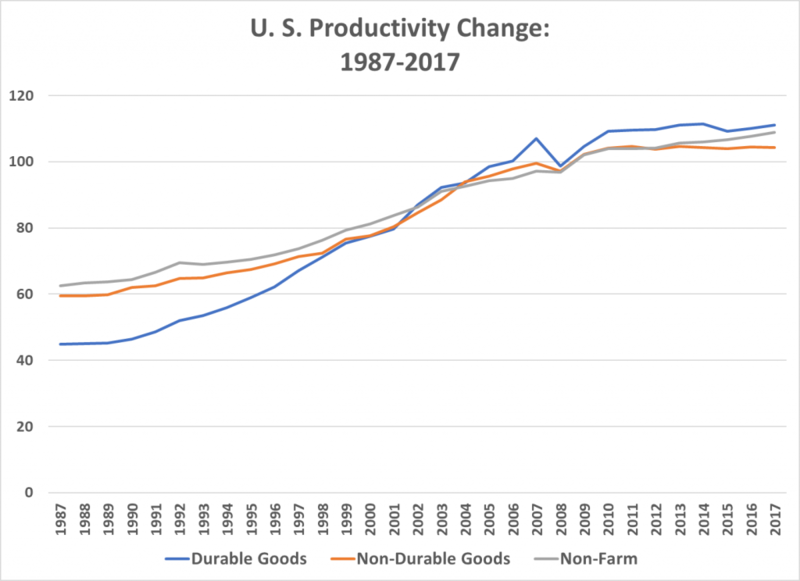 Because differences in labor force participation between counties are relatively small, it is important to recognize that their relative performance can vary from year to year because of sampling error. 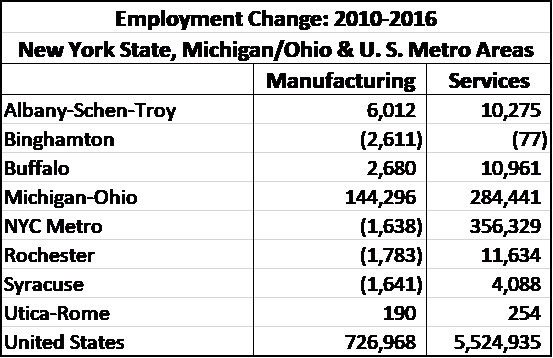 For example, Schenectady County’s labor participation rate was reported as 63.7% in 2014, 61.7% in 2015, and 64.7% in 2016. 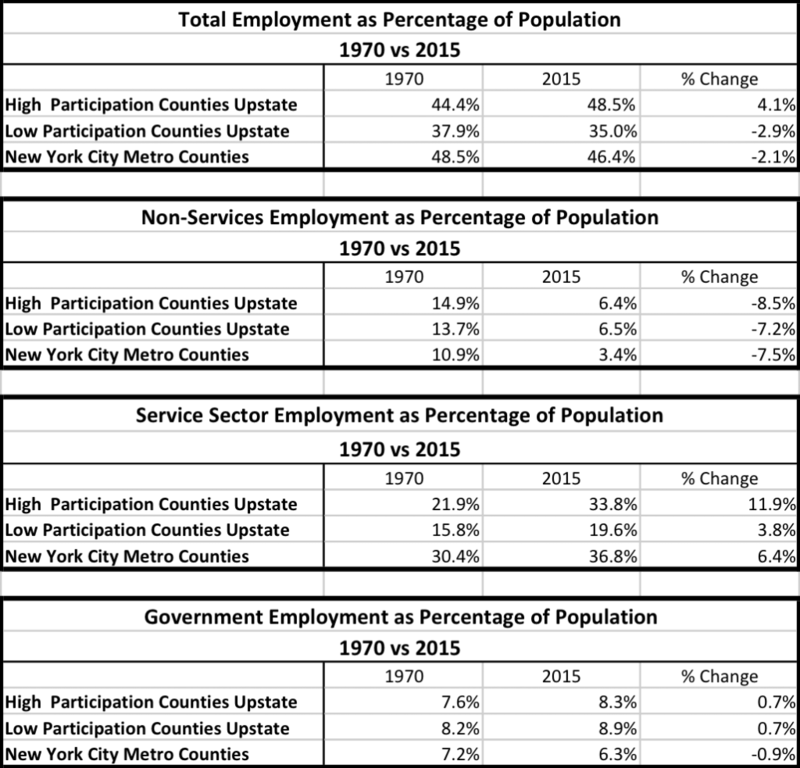 That kind of variation could reflect sample variation around the true participation level. 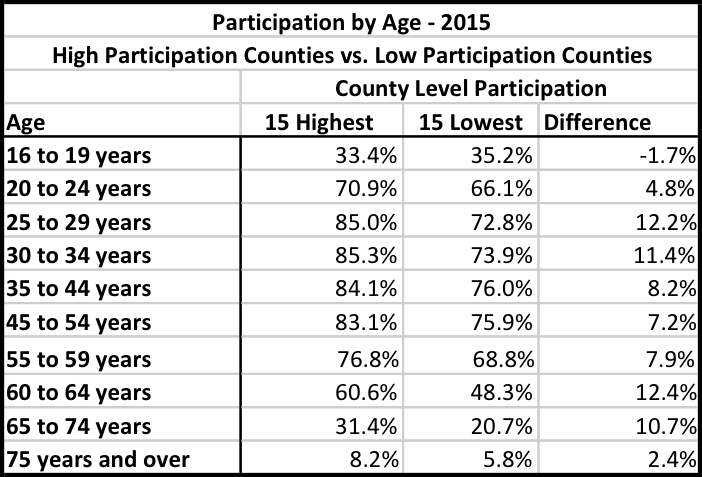 The tables showing change over time between 2005 and 1026 are based on the American Community Survey data for a single year. Counties in the New York Metropolitan areas saw relatively wide variations in the change in the level of labor force participation between 2005 and 2016. For example, Kings County (Bronx) saw an increase from 59.7% to 63.9% over the period, while Dutchess County saw a decrease of 6.2% from 68.4% to 62.2%. Two thirds of the counties in the metropolitan area did better than the national average, based on the American Community Survey sample data. Three quarters – nine of twelve counties in the New York metropolitan area had participation rates that were higher than the national average in 2016, compared with seven of twelve in 2005. Census Bureau’s American Community Survey 2016 one year data includes 26 of 50 counties outside the New York Metropolitan area. 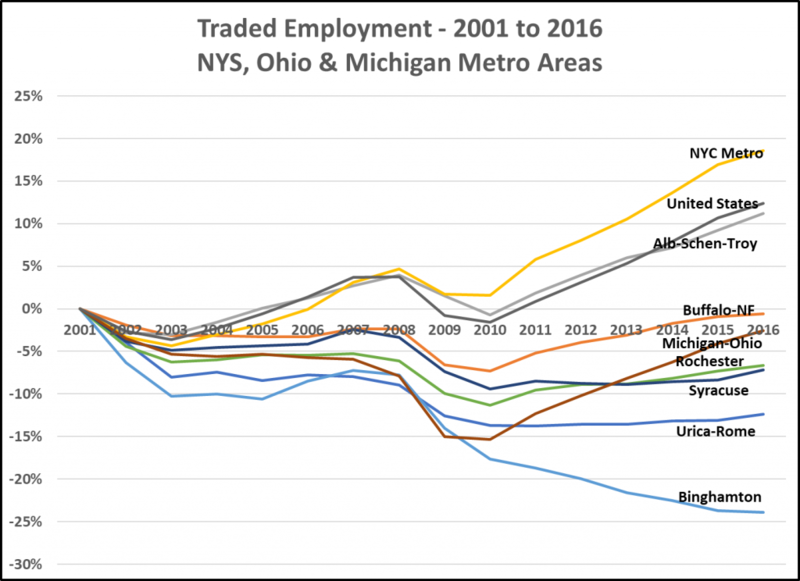 In upstate New York, larger metropolitan counties, like Monroe, Schenectady, Saratoga, Albany, Niagara and Erie County had smaller percentage labor force participation losses between 2005 and 2016 than did the nation . Others, like Rensselaer County, Onondaga County and Cayuga County were near enough to the national average to be within the margin of error of the national estimate. Many small upstate counties had larger declines than the nation as a whole. 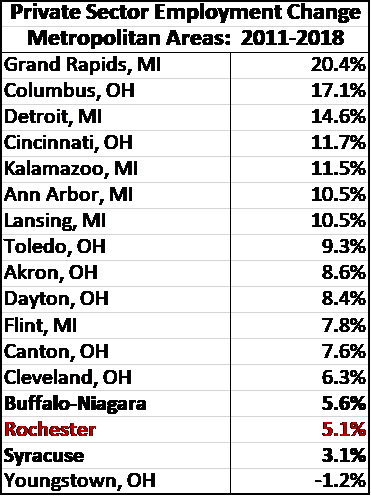 Decreases in Broome County (5.8%), Ulster County (5.9%), St. Lawrence County (6.1%), Oswego County (6.2%), Chautauqua County (6.5%), Clinton County (6.7%), Ontario County (8.3%) and Sullivan County (9.9%) were all more than twice as great as the national average. It is also important to note that all of these counties had participation rates in 2015 that were significantly lower than the national average. 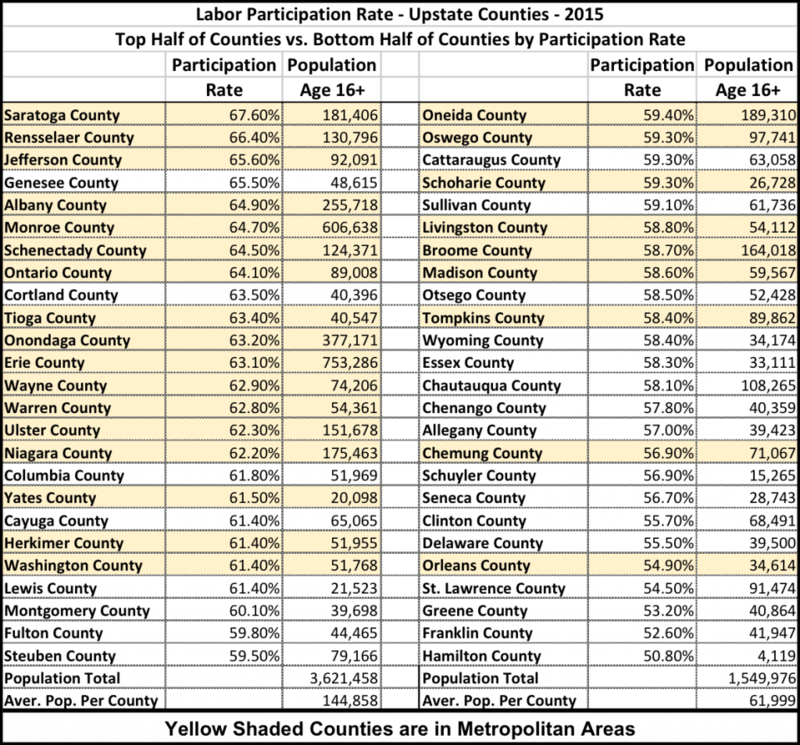 Chautauqua County was lowest at 55%. 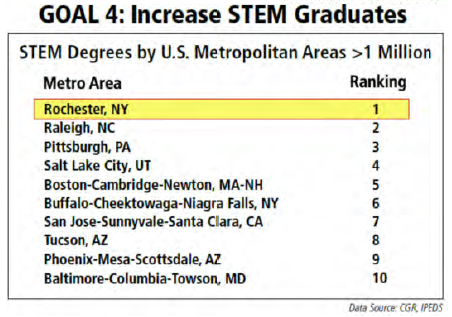 Seven upstate metropolitan areas had participation rates that were greater than the national average, compared with 18 that were below it. In 2005, eight upstate counties had participation rates that were higher than the nation as a whole, and 17 were below. The American Community Survey five-year sample from 2011 to 2o15 used in the following section has a margin of error of approximately plus or minus 1.3% for counties, so differences of that size between counties should not be viewed as significant. Because this data has a different time period (2011 to 2015) and sample size, the numbers differ from the discussion of change above. Nationally, 63.7% of people 16 years old or older were in the labor force in 2015. In New York State, participation in 2015 ranged from 67.6% in Putnam County, where 67.6% were in the labor force, to 50.8% in Hamilton County. 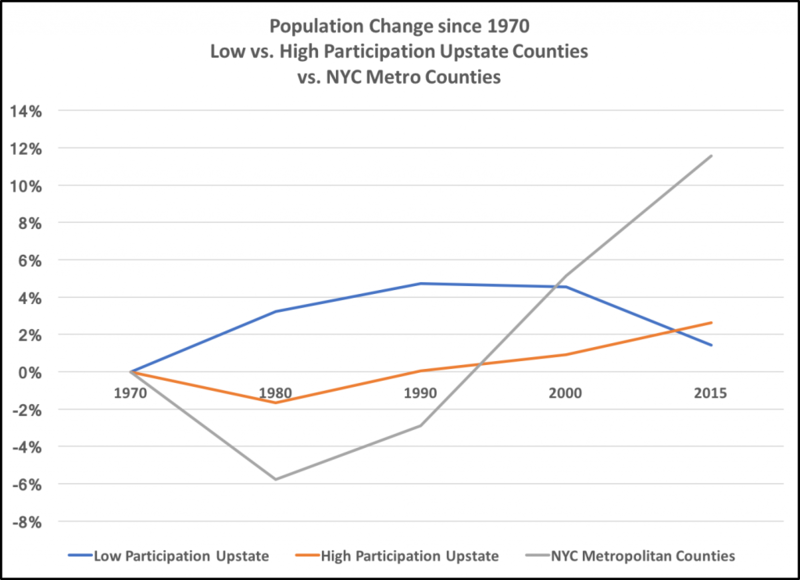 Overall, participation levels were higher in the New York metropolitan area (65.3%) than in upstate counties (60.0%). Two of five counties in New York City (New York, and Queens) had participation rates in 2015 that were above the national average, while three had rates that were below (Kings, Bronx and Richmond). Suburban counties in the New York City Metropolitan Area were above the national average. At the individual level, education is a significant predictor of labor force participation. People with a bachelor’s degree or higher are 27% more likely to be employed or seeking employment than those with have not graduated from high school. In 2015, there were large differences in educational attainment in the 15 counties with the highest labor market participation and the 15 with the lowest participation. Counties with high levels of participation had 15% fewer people whose highest level of educational attainment was high school graduation than did counties with low levels of participation. Counties with high levels of participation in 2015 had 24% more people who had attained a Bachelor’s degree or higher than did the 15 counties with the lowest participation levels. Comparing the top quarter of counties ranked by labor market participation with the bottom quarter, the largest divide in participation is for people with less than a high school degree. On average, only 41% of those with less than a high school diploma were labor market participants in 2015 in the lowest quarter of counties ranked by participation. In the quarter of counties with the highest participation levels, 62% of those with less than a high school diploma participate. At the opposite end of the educational spectrum, the difference in labor market participation levels for those with a Bachelor’s degree or more was only 3.3% – 87.1% vs. 83.3%. Like education, age is related to labor market participation at the individual level. Young (16-19 years old)and old (60+) people participate at lower rates than workers of other ages. As a result, it is not surprising that counties whose populations have higher percentages of older people have lower labor participation rates than counties with younger populations. This section compares labor market participation levels for two age groups: younger workers aged 25-44 are in age groups that show the highest levels of labor market participation overall, and older people, aged 55+ who are beginning to leave the labor market. The differences in the size of the older compared to the younger age group in the top 15 and bottom 15 counties are relatively small – in the top 15 counties, people between 25 and 44 make up 5% more of the total population than in the bottom 15 counties. Older people, aged 55 or more, are 4% more of the total population in the lowest 15 counties than in the highest 15 counties. Comparing labor force participation with age for the highest quarter of counties vs. the lowest quarter shows that participation levels differ most for those between 25 and 34 and for those who are 55 to 64 – in those cases the difference between participation levels is more than 10%. 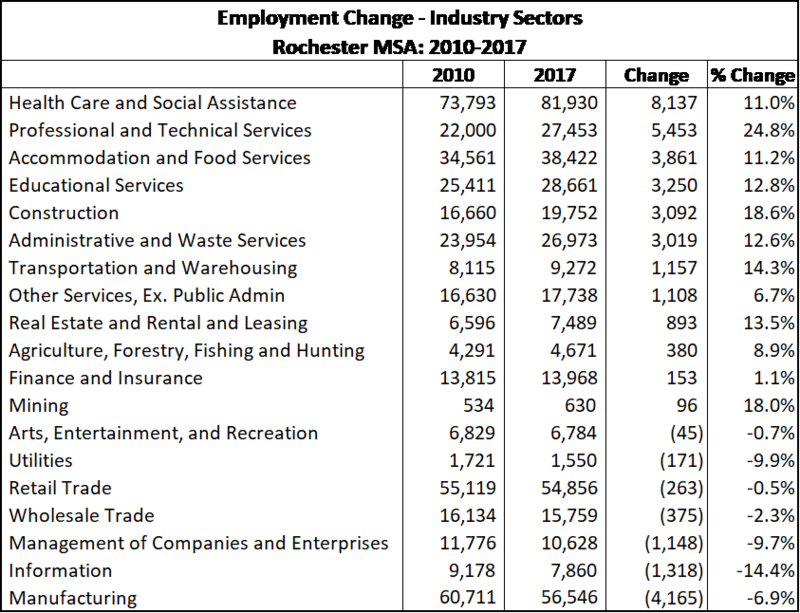 Statewide, 81.4% of men and 72.8% of women were in the labor force in 2015. Although difference between the labor participation rate of women living in the top quarter of counties ranked by labor participation compared with the lowest quarter of counties was 4.9%, the difference in participation rates for men in high versus low participation rates was much larger – 13.9%. For this analysis, the state has been separated into the New York City Metropolitan area and the rest of the state, because of significant differences in the levels of black/Afro-American and hispanic labor participation. Because the number of black and Hispanic residents of low participation counties New York City Metropolitan Area is quite small, the comparisons presented here are between the top half of counties by labor market participation and the bottom half. In the New York City Metropolitan area, the top half of counties ranked by labor market participation had populations in 2015 aged 16 or over that were 52% white, compared with 34% white for the lower participation counties. High participation counties had 8% less black/Afro-American residents and 4.5% less Hispanic/Latino residents. Upstate, the top half of counties ranked by labor market participation in 2015 had populations in 2015 that were 82% white, compared with 87% white in lower participation counties. Blacks/African-Americans comprised 4.4% more of the population aged 16 or more in higher participation counties than in lower participation counties. In the New York City metropolitan area, participation rates for blacks/Afro-Americans, Hispanics and whites were similar in the low and high participation counties in 2015. The difference in labor force participation in high and low participation counties was only 3.1%. For black/Afro-American, participation is 63% in both high and low participation counties. Hispanic and white residents participated more in the labor market in high participation counties by 3% and 4% respectively. In upstate counties, the picture differs. White labor market participation in high participation counties was 5.3% higher in 2015 than in low participation counties. Hispanic labor market participation was 14% higher in high participation counties than in low participation counties. For black/African-American residents, the difference was 25% in 2015, with participation averaging only 34% in low participation counties, compared with 59% in high participation counties. In the New York Metropolitan area, county populations aged 16 or over are large – averaging 650,000 for high participation counties, and 1.1 million for lower participation counties. 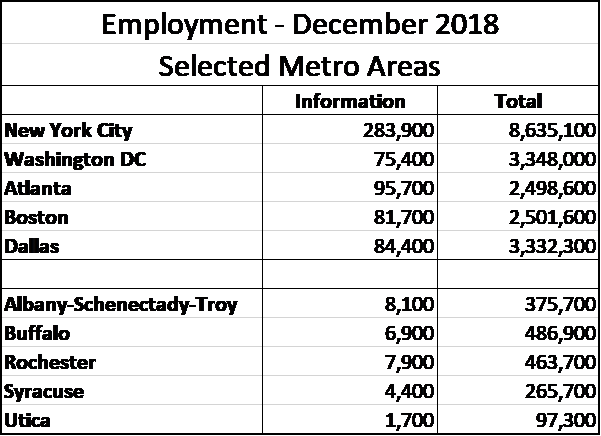 Additionally, the range of labor participation levels in the New York Metropolitan area was relatively small in 2015, and participation levels were higher overall than upstate. In fact, the participation rate for the lowest county in the New York Metropolitan area – Staten Island – was within 1/10th of one percent of the average for upstate counties. The range for upstate counties was much larger. 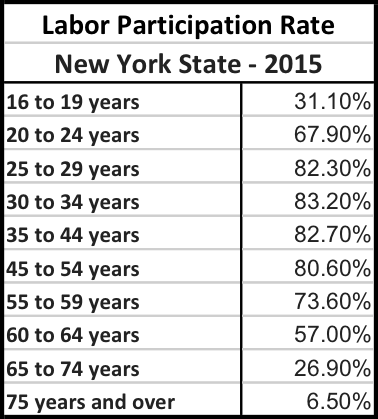 Saratoga County’s participation rate of 67.6% was the second highest in the state, while Hamilton County’s was 50.8%, almost 9% lower than the lowest county in the New York Metropolitan area. 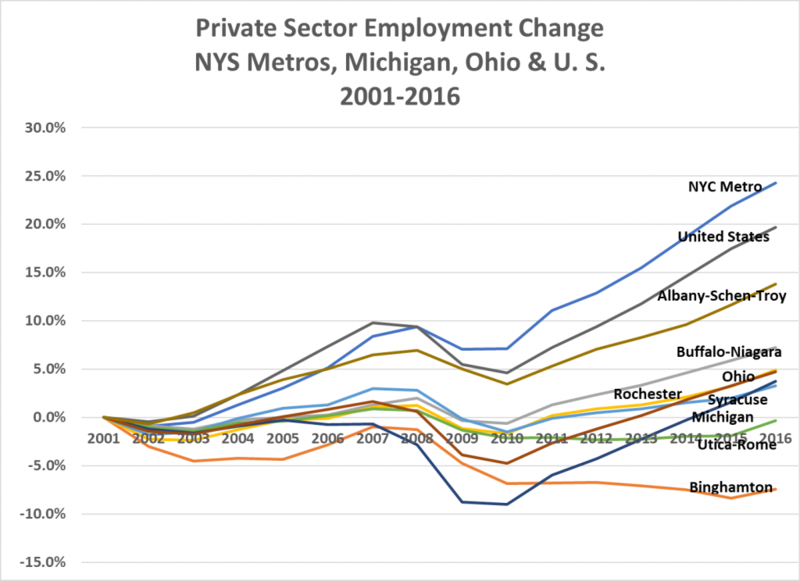 In Upstate New York, labor force participation is higher in large metropolitan areas than in small ones. This finding suggests that areas with smaller populations do not provide the opportunities for employment that are offered by larger ones. Two characteristics showed consistent differences between counties with low and high participation levels – education and age. Of the two, educational attainment showed much larger variations between counties with high participation levels and those with low levels of labor market participation. The difference in the percentage of residents with college degrees or more is particularly striking: 45.4% in the 15 counties with the highest levels of labor market participation, and 21% in the 15 counties with the lowest levels. In contrast, 35.5% of residents in counties with low participation levels had ended their education at high school graduation, while 21% of those in counties with high levels of participation had only graduated high school, a difference of 14%. A portion of the variation in the educational attainment of residents between counties is likely to be a result of the differing levels of educational levels of educational attainment of young adults who were raised in those counties. 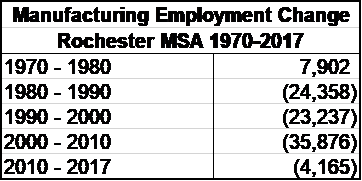 Another part stems from migration patterns of young people seeking and finding first jobs inside and outside their home counties. Determining the relative contribution of each factor is beyond the scope of this research. It was expected from previous research that counties having a higher proportion of older residents would have lower participation levels than those with younger residents. But, the differences found in counties in New York State were less significant than those for educational attainment. The percentage of residents aged 25-44 was about 5% higher in high participation counties than in low counties, while the percentage of those 55 years old or older was 4% less. Much lower labor market participation by people who did not complete high school in the 15 lowest participation counties, compared with the highest participation counties – 41% vs. 62%. Significantly lower participation by workers aged 25 to 34 and 60-74 in low participation counties: differences exceeded 10% between the bottom and top quarter of counties sorted by labor participation. Much lower participation by males in the 15 lowest participation counties, compared to the 15 highest (14%) than by females (5%). Very large differences in participation levels for black/Afro-American residents and Hispanic/Latino residents between upstate counties with low and high labor participation levels – 25% for black/Afro-American residents and 14% for hispanic residents. Differences in participation within groups between counties that have low and high labor participation levels at least partially reflect the hypothesis that people have been unable to find jobs and have left the labor force. But beyond that, the data shows that some groups are much more likely than others to be absent from the labor force in low participation counties. These include people with little education, men, young and old workers, and blacks and Hispanics. 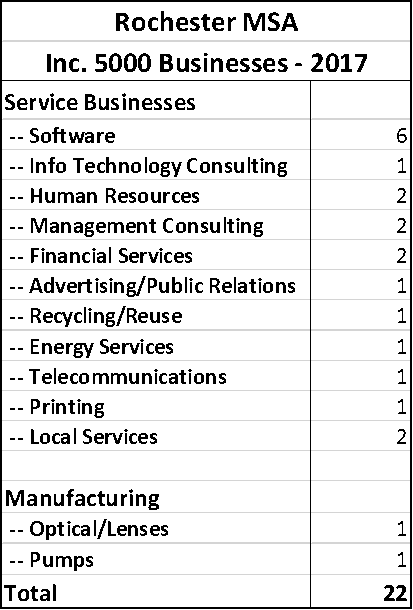 The low levels of participation of these groups in low participation counties probably reflect reinforcing factors, like lower average levels of education among minority group members, the decline of manufacturing industries that employed low skilled men, and low levels of demand for workers without college educations in places where there are relatively few jobs available. 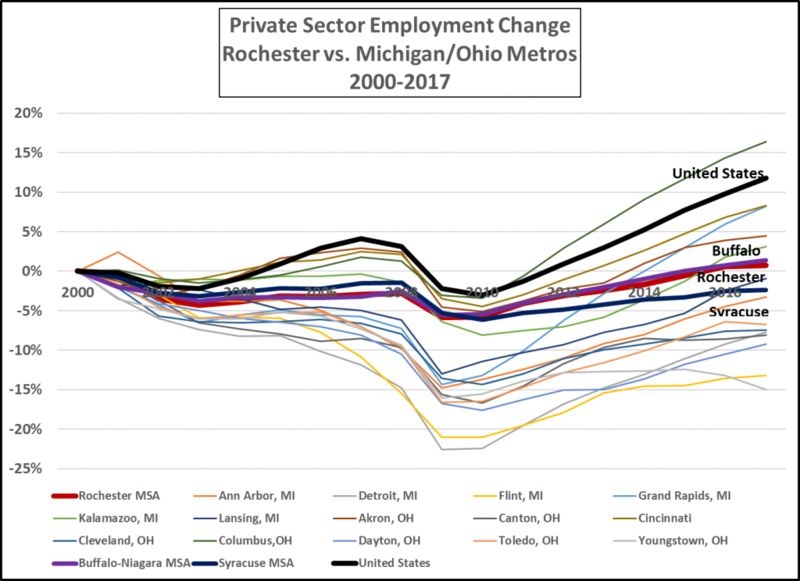 These differences are not present in the New York City metropolitan area, where most counties have relatively high labor market participation levels, or in larger upstate metropolitan areas, like Buffalo, Rochester, Syracuse and Albany, but they are significant is smaller urban areas like Utica, Binghamton and Elmira, and in rural areas of New York State. To the extent that New York’s development policies can be based on need, one focus should be on upstate’s small urban areas and rural communities. If smaller counties are to see more labor market participation by their residents, the state must help them address the barriers that have discouraged participation by less educated people, men, blacks/Afro-Americans and Latinos, and find ways to generate jobs that retain college graduates. At the same time, policy makers concerned about the well-being of New York residents must recognize that some policies that would help residents of low participation counties access jobs could increase out-migration to locations with more employment opportunities. 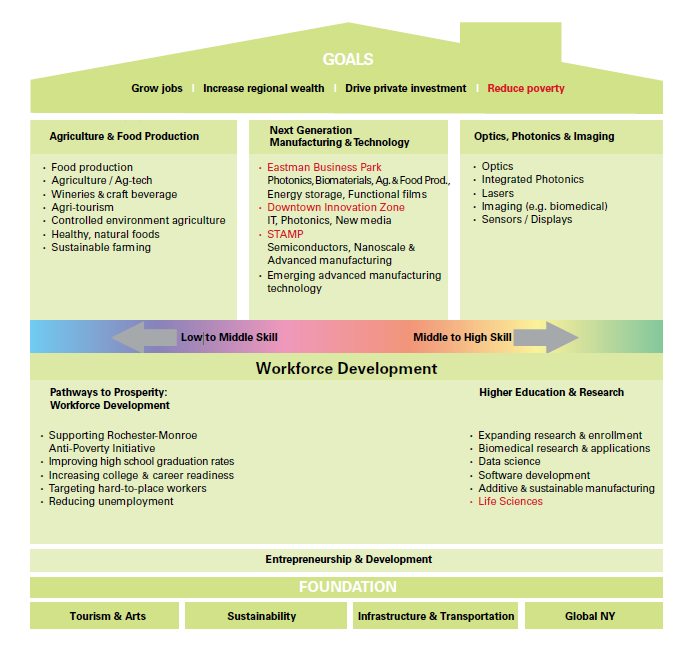 The ability of low participation counties in small metropolitan areas and rural locations to create the resources needed to diversify their economies to include occupations that match the qualifications of residents are likely to be limited, because of the significant advantages offered by locations that have larger labor pools.